Second, the social complexity of South Asia is astounding. I say this as a geneticist: the differences between different castes in the same region are hard to believe. Though there is a great deal of ethno-religious diversity in the Middle East, they are not surprising. Arabs engage in a great deal of consanguinity. Ethno-religious minorities such as Copts or Assyrians have less cosmopolitan ancestry than their Muslim neighbors. This is all to be expected. The genetic differences are something us deep about the nature of South Asian social relations. Defection to Islam occurred on the individual scale, but generally, quantity could only be had by mass conversions. Even when groups of people of the same community are of different religions it was probably through mass conversion of particular subsegments. The ability of Islam to penetrate into the Bengali-speaking peasantry was due to its fluid and unordered character. In contrast in western Bengal, a more traditional South Asia society with well-delineated caste boundaries had already crystallized by the time of the Muslim conquest. To me, this confirms the thesis of The Rise of Islam and the Bengal Frontier. 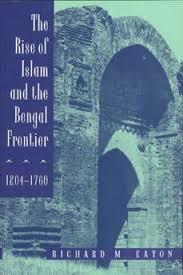 As a frontier society, eastern Bengal was mixed in a way where the structure socially and genetically that was the norm in most of South Asia by the time the Muslims arrived. Without the powerful collective substructure, Islam was able to swallow up the rural society in toto. Perhaps the best analogy might be to Indian communities in Trinidad, where caste has mostly disappeared, and Christianity has made extensive inroads.